The BF and I decided (shortly after I returned from Africa) to take a short jaunt over the Christmas holidays. We short-listed it to Mexico or Panama – and Panama won. It seemed to have just a bit more to offer than a Mexican resort, although I would still like to try out a resort on the Mayan Riviera, and visit Chitzen Itza while I’m there. So we took our time, pricing tickets on various websites, before buying a ticket to Panama City. Our routing wasn’t the best – on the way there we had an overnight in Washington D.C, on the way back we were to fly to Houston, have an 8 hour layover, then fly to Newark, where we were to land around 9 pm, and fly out to Ottawa around 1:14 a.m.
We had booked a hotel close to the airport, and wouldn’t you know it – the hotel restaurant/bar had just closed. So after checking in, and dropping off our one bag (my carry-on) we walked to the next hotel, where we managed to wheedle not only food, but beer. The next day we flew to Panama City, and headed through immigration to the luggage carousels. Where we waited. And waited. And waited. 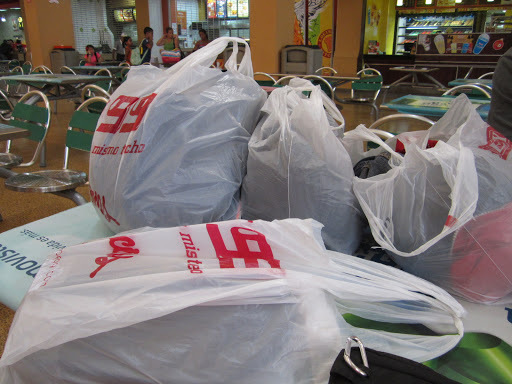 An hour later, all bags from our flight had been unloaded, except ours (yes, both). We filed a “missing bags” report, and headed out into the humid air of Panama, to our waiting pick-up. 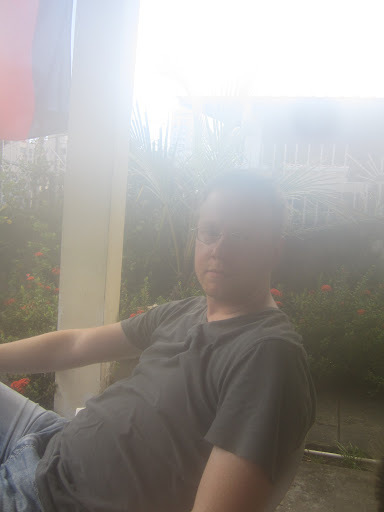 The air was so humid, my camera lens fogged up. 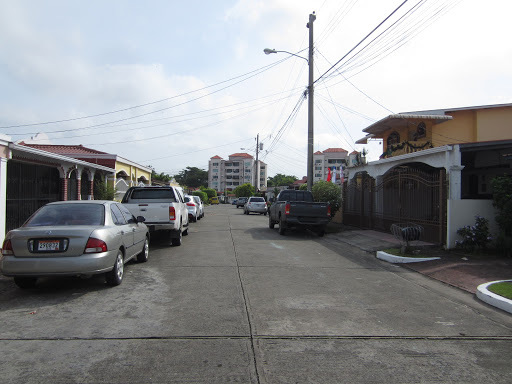 We were staying for one night in Panama City at Hostel Aleman, a small hostel in a nice neighbourhood in Panama City. While a little far from the sites, the host, Patrick, is fantastic. He was on the phone with Copa (the airline who managed to lose our luggage, although I still blame United as they were the first leg, to D.C.) trying to sort out our luggage problem. The next day was Christmas, and we were off (by bus) to Playa Venao, and the Eco Venao lodge. We were in a comfortable coach bus, and the ride wasn’t too long. 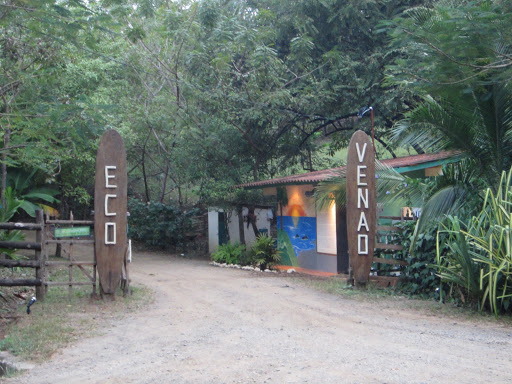 In Las Tablas, we hailed a cab, and for $40 we were taken straight to Eco Venao, a 30 minute ride away. The lodge is actually several buildings – we were staying in a “casita” a small building that was two separate rooms joined by one wall. 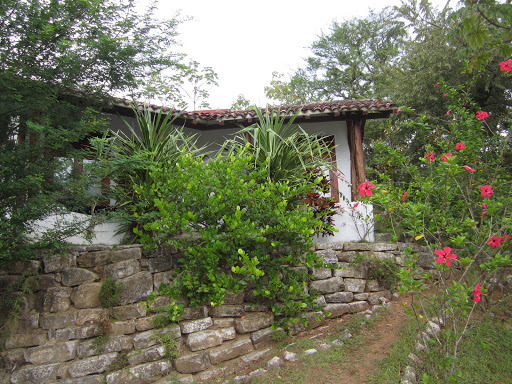 We had a luxurious bathroom (with stone tiles for the floor, and a massive piece of wood that separated the toilet and sink from the shower), air conditioning, and outside our door a hammock. We also had a view of the ocean from our casita, as we were located on the top of a small hill. The lodge is on the “jungle” side of the road, and the ocean is on the other. It’s about a 5 minute walk to the ocean (from the casita), another 10 minutes to get to the more popular area of the beach, near the El Sitio hotel and restaurant. I highly recommend the restaurant at the El Sitio hotel. The food is amazing, the staff is wonderful, and the beer is cold! There are chairs and table, high tables with bar stools, and couches that you can sit on. The couches are a fake leather, so you can sit on them with a wet bathing suit on and not have to worry about what you’re doing to the couch. The beach in front is quite nice, with a tree for shade. It is predominately filled with surfers, with there are always a few people in and out of the water, playing around. I do not recommend the surf shop’s surfing lessons. We booked a one-hour lesson, and when we went to met our instructor, we were told, “he’s a darker-skinned guy, he’ll be in front of the hotel.” There was no one there – we waited around for 15 minutes, then went back to the surf shop, where we got a shrug, and no explanation. It wasn’t until the receptionist from our lodge showed up, and found the instructor for us (he was giving a lesson to someone else), that our lesson began. We were told to just get in the water, never mind that I had only surfed once before (a year previously) and my BF never. It was frustrating – we were being pounded by waves, and trying to stand up on our boards, with no instruction on how to stand up. We could have just rented boards if we had wanted to do that. Eventually, the instructor took us onto land, and we received a quick tutorial, before it was back in the water to try again. If you want to learn how to surf, and are going to Central America, go to Matt at Point Break Surf. That’s where I learned the first time, and it was fun, easy, and most importantly, I actually surfed! But back to Panama. After 3 days at Eco Venao, we caught another bus back to Panama City, with all of our “luggage” in tow. We stayed at the Toscanna Inn on our second stay in Panama City. The hotel itself is very nice – the rooms are a good size, the hotel and rooms are clean, it’s quiet, and it’s easy to get to all the sites from here. There are also several restaurants, car rental agencies, and souvenir shops in the area. However, the hotel restaurant is not that great – they serve lots of processed cheese, iceberg lettuce, pre-slice packaged bread, very low end food. It’s not bad, but there are better options in the area than eating at the hotel. The staff is….not very helpful, and definitely not informative. When we asked what they would recommend we see or do, we got a shrug and a “well, there’s not much…” When we mentioned that we had no luggage, and had to call Copa Airlines to find out where it was, they said we could do that in our rooms. On checking out – there was a $12 US fee for using the phone that we hadn’t been warned about. All in all, our stay was comfortable, but we wouldn’t go back. We did a tour of the canal with Canal and Bay tours – lots of food (pasta, salads, buns, fruit, cake, bean salad, beef, chicken – something for everyone!) for both breakfast and lunch, and the tour guide was a good blend between talkative, and giving you time to take in your surroundings. 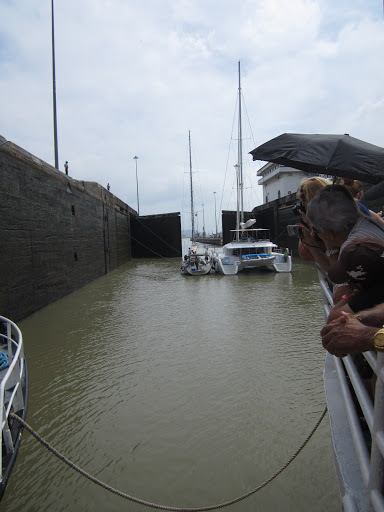 We were bused to Gamboa, where we boarded the boat, and then toured south on the canal to Panama City. We did a partial transit, which I think was the better choice in the end, as it did get a little boring (hey look! More shoreline that looked just like the shoreline an hour ago). While in Panama City we also visited Panama Viejo, the original Spanish capital of Panama. It’s about $5 to see the ruins, twice that if you to see the museum as well. 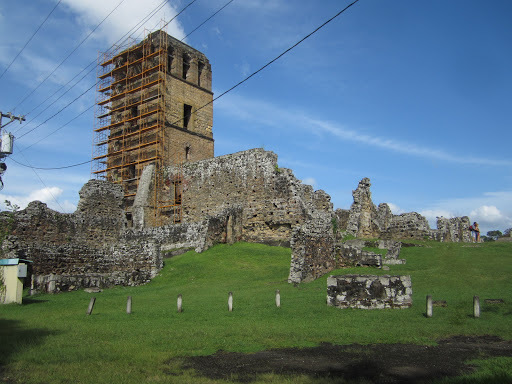 The ruins are close to the bad part of Panama City, so go during the day, take a taxi to and from, and stick to areas that have placards telling you what each ruin originally was. 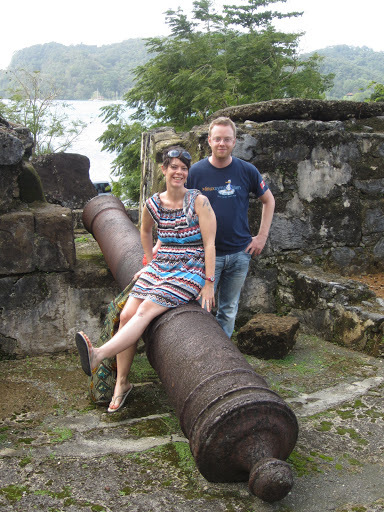 We drove the 1.5 hours to Portobelo, where our taxi driver gave us a tour of the ruins of Fort San Lorenzo. The ruins are as the Spanish left them – with canons strewn all over the ground, some rusting in puddles even. They’re not well maintained by any stretch, and some of the tunnels under the ramparts smell strongly of urine. I would have loved to have gone through them, but after two steps…i turned back. It’s a pity that they aren’t protected, but at the same time it really does give you an idea of the passage of time – and I’m sure the original soldiers used the tunnels for similar reasons. After the ruins, we headed to the Black Christ church – a local church that has had a statue of a black Jesus since the 17th century. There’s quite a few legends surrounding the Black Christ, and which one is true I couldn’t say. 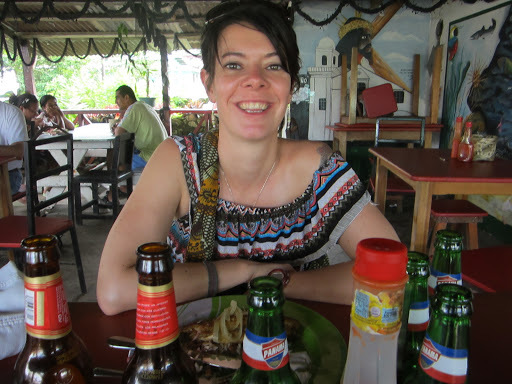 After lighting a candle at the church, we went for lunch in a tiny, Panamanian restaurant. After that, we took a quick boat tour over to the other side of the bay to see the other ruins. After that it was back to the city, for one last night . early the Panama City, for one last night. 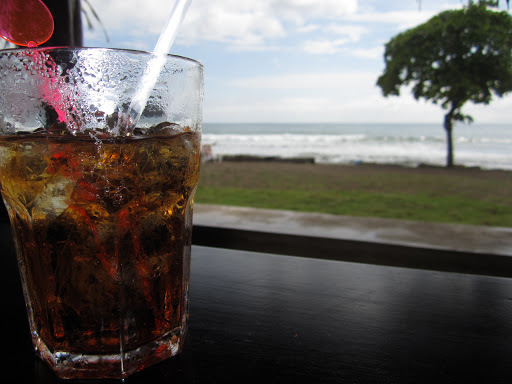 Breakfast on the Pacific, lunch on the Caribbean! Early the next morning, we headed to Casco Viejo, the oldest part of Panama City. 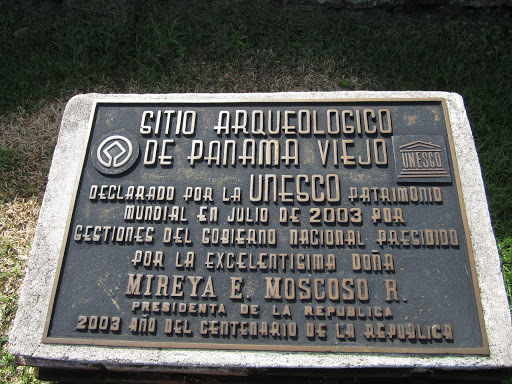 After Panama Viejo was sacked, the inhabitants of the region moved the city 8 kilometres, on peninsula. When the canal was being built, all the locals with money moved to what we now call Panama City, and Casco Viejo was left to rot. Which it did. There are ruins, there are half crumbled buildings. Nature has taken over in some places – in fact I saw one building that was missing windows, doors, floors, the roof, but still had its walls. Growing inside was a miniature forest. However, recently the city and its inhabitants have been renovating many of the buildings. Walking around this part of the city is surreal, as the intact buildings abut the derelict ones, creating a very exotic picture. I think this was the highlight of our trip. 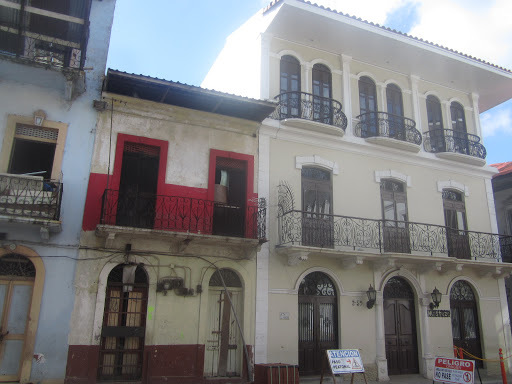 I would highly recommend getting a hotel in or near Casco Viejo, rather than in another part of Panama City,. So after I wrote and published my post from the other day, I remembered that I had left off a few important sites. How many times have you wondered what type of electrical outlet you’ll be dealing with at your destination? If you travel like me, probably often. This site lists the different electrical systems around the world. At first glance, the information seems a bit much and confusing but if you click the letter link under the “plug” column, it takes you to a write-up, including picture!, of that type of plug. I find it really helpful when figuring out which adaptor(s) to pack. I like the website for the sheer amount of information. It’s geared towards budget travelling, and has tips, deals, writes up on different locations, contests. It’s good for single travellers, couples, familes. It is geared towards Americans, so a lot of their recommendations are in the US, but it’s still a good resource for budget planning. This site is much like Budget Travel.com, only it’s more for world travel. Again, it has a little bit of everything – photography tips, packing tips, cruise tips, and ideas for your next travel. There’s a lot here, so just start clicking. I like this site because it has items listed in different categories – so you can easily focus on what type of trip you’re taking (will you be going somewhere fancy? 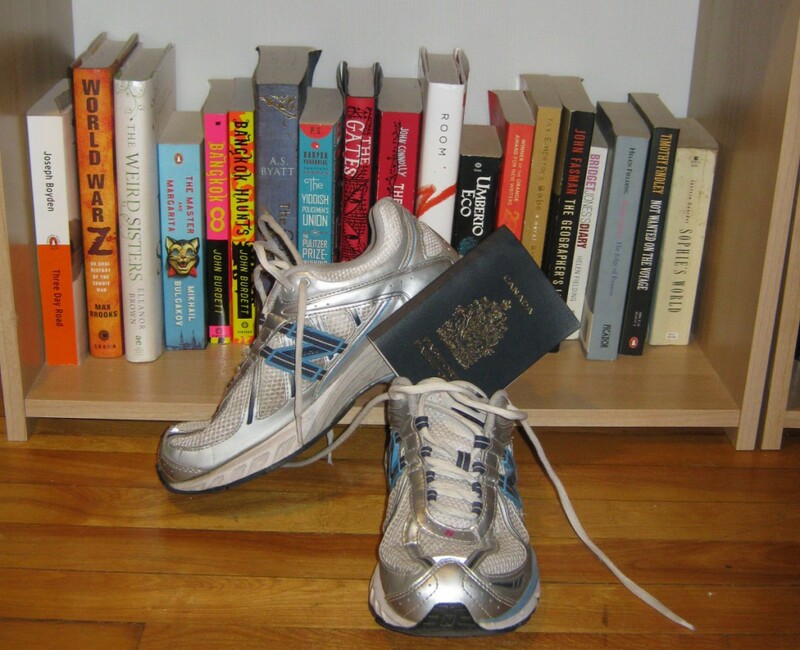 Are you doing a lot of hiking? Will you be at the beach most of the time?) and you can ignore the columns that have items that you won’t need.